Locking the tablet to your website, allowing visitors to browse through. Playing a promotional video on a loop throughout the event. Running competitions through interactive games (preferably relevant to your business). Running an optional survey to find out information about your visitors and their thoughts on your stand. Tablet displays are not only great for events and exhibitions but also for other locations such as in retail environments as a POS system, in restaurants to assist with ordering or seating guests and even in the home. The Telescopic iPad Floor Stand is our best value stand, at just £49.00. This tablet display features a telescopic pole which allows you to adjust the tablet enclosure to a height of your liking between 780mm and 1225mm. The Telescopic iPad Floor Stand is compatible with the iPad 2, 3, 4 and the iPad Air. The cable management system allows the power cable and any other cables you need to be hidden from view which presents a cleaner and more professional appearance. For security, this floor stand can be fixed to the floor using the holes on the base (screws included). The enclosure itself can also be locked to prevent theft with two keys provided. The enclosure for the Telescopic iPad Floor Stand can swivel between portrait and landscape orientations. Overall, the Telescopic iPad Floor Stand is a fantastic iPad display for businesses with a lower exhibition budget. The MoonBase POS Tablet Display Stand is a desktop/mountable tablet display stand suitable for the iPad or Samsung Galaxy. The LaunchPad Tablet Floor Stand is also a tablet display suitable for the iPad or Samusung Galaxy however it is freestanding. Both the MoonBase and the LaunchPad provide fantastic value for money, starting at just £77.00. The enclosure features 45° movement for screen sharing as well as 330° rotations, allowing for portrait and landscape orientations. The MoonBase and LaunchPad tablet stands are compatible with the Apple iPad 4 ‘Retina’, iPad Air, iPad Air 2 or the Samsung Galaxy Tab, the TabPRO and Tab 4. A lock and cable for security is available as an optional extra with both of these stands and helps to secure your iPad display to a solid object to prevent theft. These tablet display stands are ideal for use in retail stores as POS systems, restaurants, at events and even in the home. The MoonBase is especially useful for home use as it is a desktop tablet display that can be used in the kitchen to easily view recipes online. Both the LaunchPad and the MoonBase feature hidden power options which provide a professional appearance and allow you to keep the tablet charged throughout the day. The MoonBase and LaunchPad are both good options if you are looking for a hard wearing and reliable tablet display that features excellent movement for rotation and screen sharing. It is also ideal as it is compatible with both the iPad and Samsung Galaxy, providing the user with more options. 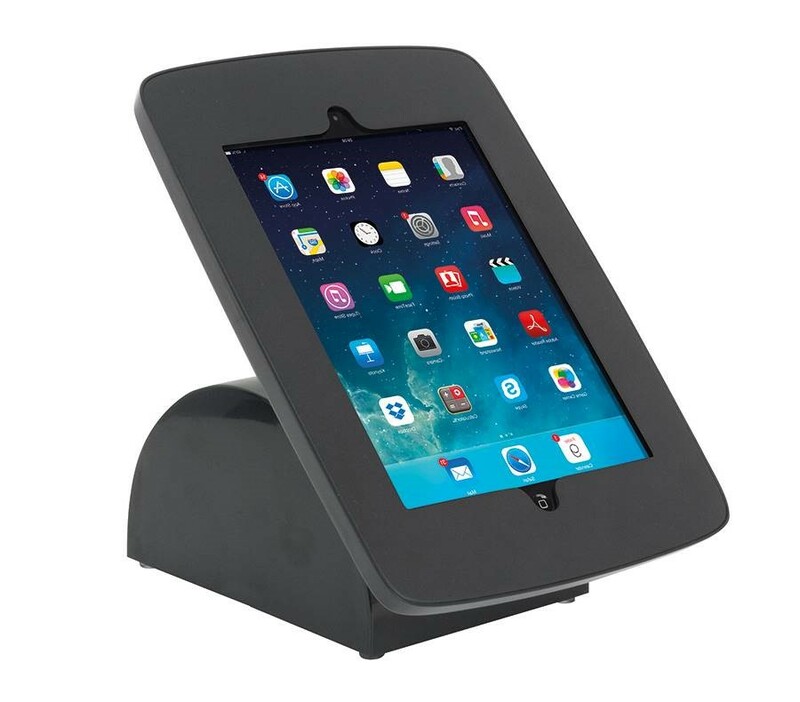 The Design iPad POS Stand is ideal for exhibition, trade show and retail use. It features a sleek and stylish silver aluminium post with a secure 360° rotating iPad enclosure. The enclosure for the iPad is available in either black, white or silver. A shelf and literature holder are also included as standard, with the literature holder available in three different sizes – DL, A5 and A4. The shelf is manufactured using MDF and is supplied in a silver finish. It is ideal for displaying business cards, marketing literature or small product samples. This tablet stand is easy to assemble in just a few minutes and is also easy to store and transport. The Design iPad POS Stand is compatible with the iPad 1, 2, 3, 4 and the iPad Air. The Design iPad POS Stand is the ideal option for businesses that want to display more than just an iPad at their stand. Literature can be displayed in the literature holders and business cards/marketing literature can be placed on the shelf. The Formulate iPad Retail Display is a practical and aesthetically appealing alternative. 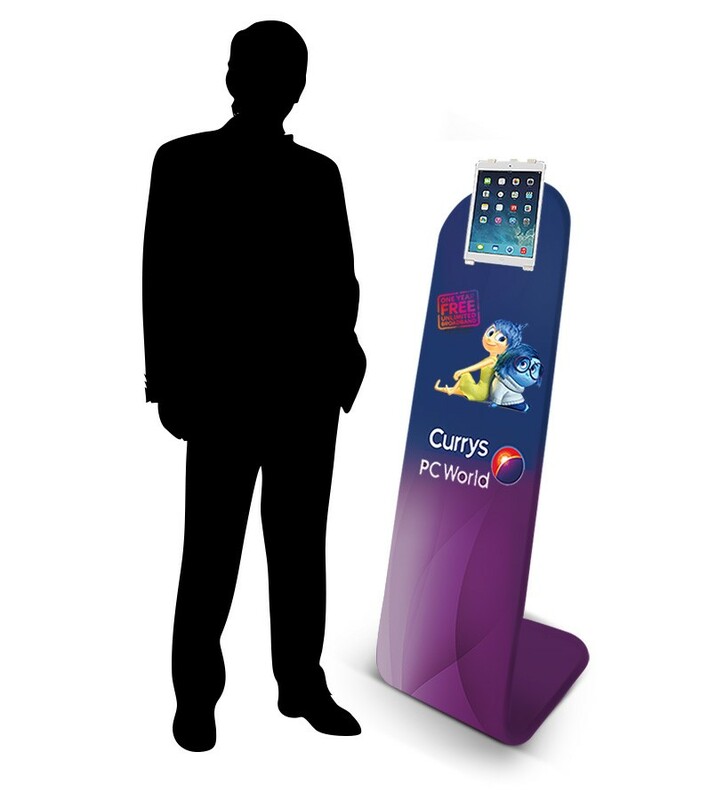 It is a way to include your artwork of branding into an interactive display stand. The display is constructed using a lightweight 32mm tubular aluminium frame, an easy-fit tension graphic sock slides over the frame and zips closed. The iPad is then held in position with a clamp and bracket. The lightweight frame and fabric graphic means this is one of the lightest and most portable iPad displays available. The iPad enclosure itself can rotate a full 360°, allowing for a range of different viewing angles. The graphic is printed onto tension fabric to photo quality standard. You can provide us with your own artwork or we offer a graphic design serviceand we can design your Formulate iPad Retail Display for you. The innovative quick release feature means the Formulate iPad Retail Display is compatible with all iPad models as well as all other tablet models that fit within 132mm – 249mm (h) x 11mm (d). The Formulate iPad Retail Display is a fantastic option for businesses looking to stand out among their competitors and boost their brand image by using an iPad stand combined with a printed display. We also offer a range of other iPad Stands that are suitable for different budgets and situations. These include the iPad Floor Stand, Universal iPad and Tablet Stand, iPad Desk Mount, iPad Versa 2 Display Stand and the iPad Wall Mount. iPad display stands also work well in conjunction with branded tablecloths, printed roller banners and pop up displays. For more information about our iPad Display Stands or help with selecting the right tablet display for you, please contact us or call us on 01733 511030.